I’ve been thinking about Catcher’s performance at a recent dog show and training match and realize that I need to re-evaluate my goals with him and my puppies. Catcher is NOT ready for the ring. In fact we are probably a year away from returning to competition. Besides, what’s the rush? I am not the high quality trainer I’d like to be but I do enjoy training, learning and obsessing over how to communicate with my dogs. I want my dogs to enjoy our limited time in the competition ring and for both of us to feel confident. That means I have to block out people around me, whether it is people hoping to see me fail or friends cheering me ringside. I need to think positive; to remember that any bizarre twists my dog gives to my long-established commands can be fixed back home. With that in mind I need PHP; Perspective: I need to realize whether my dog passes or fails it doesn’t mean life or death to either of us; Humor: because the darn dog goosed me in the rear again in front of another judge, and Patience: back to the drawing board again and again. PHP, good letters to mark on my hand before going into the ring. I am constantly reminded of something the late dog trainer Bobbie Anderson said, “This is just a game and we are lucky to play”. Competing is not something I enjoy, which my dog’s sense. They have seen me happy, sad and angry and frustrated. So why even bother? The dog show competition ring is one of the few ways to “prove” ourselves as dog trainers. I remember my first few years showing dogs back in the 70’s. Ignorance is bliss. When you don’t know you are supposed to be nervous, when you don’t know all the bad stuff that dogs will pull on you, when you don’t know that other, more experienced trainers are rolling their eyes when you perform, then you go into the ring and have fun with your dog, which I did. I miss that feeling. 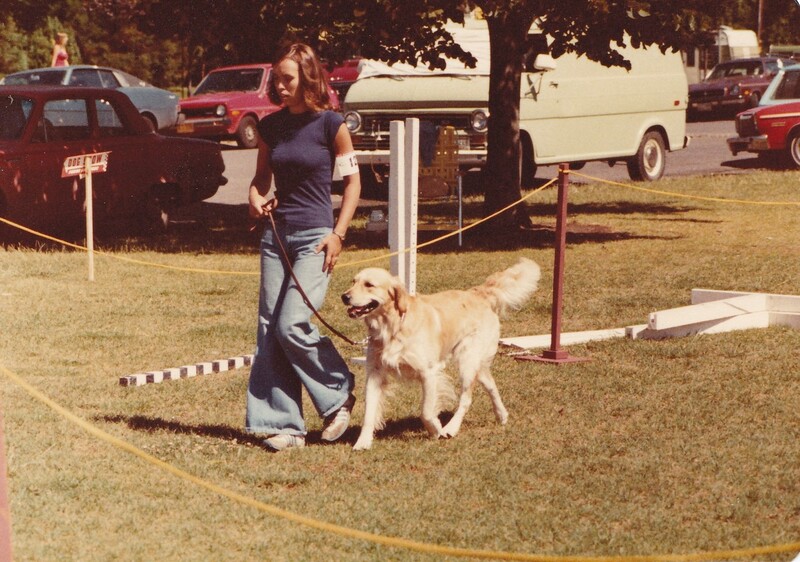 Of course, I was lucky that my first competition dog was hot, another word for easy to train, smart and picked up blue ribbons with one paw tied behind his back. Then harder dogs came into my life and that forced me to actually think about the how’s and why’s of dog training. I attended seminars, went to well-known trainers, belonged to their cliques, or changed cliques and training methods. Those were the days when we drank wine ringside after the highest scoring dog in trial ribbon was awarded. Someone would bring snacks and we’d hang out and laugh and sit with our dogs. It was fun. I have some great memories. Now things have become highly competitive. The mentality is somewhat like Abby Lee Miller’s statement on the television series, Dance Moms, “Second place is the first person to lose”. (Isn’t that a sad philosophy?) There aren’t cliques like my first year in the sport. Now we have serious Obedience Trial Champion titled trainers and/or people who bring their personal trainer to help them ringside, dogs are generally from expensive breeders, and competitors wear clothes that match their dog’s coat color. So in a way I miss the old days, my naivety, the fun and laughter and the people I sat with ringside where I was immediately accepted because I trained at such and such obedience school. It’s been a blessing to have my own dedicated dog training building which I share with a few friends. Nothing can replace being able to train repetitiously day in and day out, taking videos of myself, or watching You Tube videos of more experienced and successful trainers, or asking advice online, not to mention taking lessons with a local VERY successful trainer. But I miss the simpler times when other trainers and I met at local malls to train, or went to school playgrounds on the weekends, or city parks. It was rare to train alone because we all realized you couldn’t train in a void. Dogs need to be introduced to real world noises, children, barking dogs and food smells, the things that they may encounter at a dog show. But now dogs are not allowed in the places we’d go to back then. More and more of us have our own buildings, our own trainers whom we try to emulate, and our dogs, if we aren’t careful, wind up being trained in a box, a void. It’s something I struggle with now, getting out and about to train my dogs in new places. Making it even more challenging is the hot, humid weather here in the south. We have to run the AC in the car for a bit before putting our dogs in their crates. Working in front of a mall now would bring Mall Security and Dog Control in a heartbeat. Every once in a while I think about quitting dog training and just letting my dogs be dogs, running, playing and sleeping all day. But this darn dog training and competitive sport has me like cocaine grabs a drug addict. I know I’d teach my dogs to do tricks and then teach them to come promptly across the yard and then teach sits and downs. Then off we’d be in the dog show ring again. I keep reminding myself how wonderful it is to have the ability every day to communicate with another species and to be loved in return. What a gift. The stress of the dog show ring is forgotten. So I’ll plug along with my three competition dogs (Levi is retired) and hope we can strut our stuff to a close approximation of perfect in the dog show ring sometime in the future. I’m just plain hooked on dogs, training and shows. But I sure miss the old days of wine and cheese after the last dog performed. This entry was posted in Bobbie Anderson, border collies, dog obedience, dog obedience trials, Dog training, Dogs, Florida, Retirement Life and tagged Border Collies, Dog, dog obedience, Dog training, dogs, Obedience training, Obedience trial, Pets, retired life. Bookmark the permalink. Great post! While I have not showed dogs much, I can relate all the same with horse shows and miss the “old” days. (Although, I can’t say I miss the fashions at the shows in the old days..lol). I am planning on showing my Lab pup in Rally in the future and I will also be back in the horse show ring next year with my young horse. Many friends ask me “why” on both accounts. For me, it gives me a purpose to get out there and ride on the hottest days of the year or to get my pup out in the field for a session even when I would rather read blogs. Going to a show, even knowing that I might not have the best horse or dog in the ring, still gives me the chance to see where we are at training wise. What do we need to work on? What is solid? What new things can we teach? I go home, re-evaluate, set new goals and get back to work. It is just so addicting and rewarding – even if you don’t win the big award in the ring. I was thinking ( lamenting) the same thoughts this summer. A few years ago ( maybe even 25), our local village started a festival and I ran a dog obedience school. I had bunches of students in the parade with their dogs ( my own dog pulled her cart with my baby daughter in it and THAT cart had a small child’s wagon attached with my school sign in it. Our photo actually made the front page of the local paper ). we had a “booth” space and gave demos of sample classes or particular exercises for more advanced dogs ( agility was still a glimmer in someone’s eye0….and we were welcomed and enjoyed by all. fast forward to now….dogs aren’t even allowed on the grounds……and are frowned upon most places. heck, I used to give homework to students to go to the grocery store sidewalk or the downtown sidwwalk, or flea markets so their dog could learn how to behave in public. ( It also helped others see how dogs really could behave in public). Now, they are quickly being relegated to backyards and behind fences and some of us are even wary of any strangers getting a glimpse of our dogs. We are afraid that someone is going to see a dog pant and call animal control on us. I am thinking actually that we need to go on offense….take our well behaved dogs out more and more…..